Let's look at some bat history. Ah, man, there's nothing much better than hitting a fastball "right on the screws" with a wooden bat. If you played high school or American Legion ball before the invention of the aluminum bat, you know what I mean. 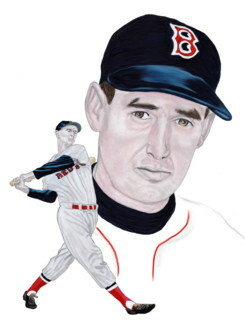 I think it was Ted Williams said that said,"you are trying to hit a round ball with a round bat...squarely." 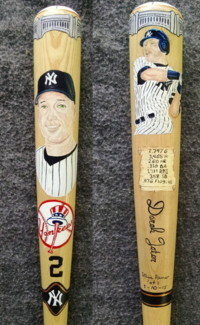 To most baseball players, their bat is a sacred object. Bat history began way back at the beginning of baseball, in the mid 1800s, most players made their own bats. The Louisville Slugger, Rawlings, Easton and Mizuno Companies didn't exist. And a lot of the bats they made were flat on one side. The players of that day thought it was easier to hit the baseball with a flat bat. The flat bat probably came from the English game of Rounders. Alexander Cartwright, the man who invented baseball (it wasn't Abner Doubleday), had a team in 1846 that played by the first set of organized baseball rules. His players started to experiment with different styles of bats. It wasn't long before they realized that they could hit the ball harder with a round bat. By 1850, the flat bat was pretty much gone from the game. In those days, the players usually made their bats from something called wagon tongue wood. These early bats had no restrictions. They could be any diameter or length. As long as the player was able to handle the bat, anything was allowed. The Professional National Association of Baseball Players voted in 1859 to put the first restrictions on the bat. Now, they could be no larger than two and a half inches in diameter. But they could still be as long as the player wanted. Finally, in 1869, the bat was restricted to 42 inches. Believe it or not, this rule still exists today. The bat is still not allowed to be longer than 42 inches. During the 1870s, players began to hire woodworkers to fashion their bats. The overall shape of the modern bat was now in place. Some woodworkers even carved a knob on the handle for better control. Some time ago, I was reading an interesting article about the Louisville Slugger bat. It seems that back in 1884, Pete Browning, who was a star outfielder for the Louisville Eclipse, broke his bat during a game. In the stands that day was a young man named John Hillerich. Hillerich and his father owned a small woodworking shop. John Hillerich told Browning that he could make a bat for him, just like the one he broke during the game. So the two went back to the woodworking shop and picked out a nice piece of white ash. John Hillerich began to shape the bat according to Browning's instructions. During the process, Browning would take a few swings with the bat and then Hillerich would do more work on it, Finally they got it just right. The next day, Browning got three hits with his new bat. Soon, not only other players from the Louisville club, but from all over the league were coming to the Hillerich wood working shop to purchase bats. The Louisville Slugger had been created along with the Hillerich family business. As the Hillerich business grew, other companies began to make bats, but none could compete with the Louisville Slugger. The baseball bat remained the same until 1898 when the Baseball rules committee increased the diameter of the barrel to 2 3/4 inches. The length restriction stayed at 42 inches. By the turn of the century, the Hillerich business was thriving. But now they had competition. The A.G. Spalding Sporting Goods Company was catching on with a bat of their own. They called it the Spalding Mushroom Bat. Balance and larger, round knob created better weight distribution. The Spalding Mushroom Model M with plain or special finish, along with their MT Model with the tapered handle sold for $1.00. In 1905, the Hillerich Company, now called J.F. Hillerich and Son, came up with a neat idea. Burning the players autograph into the barrel of the bat. 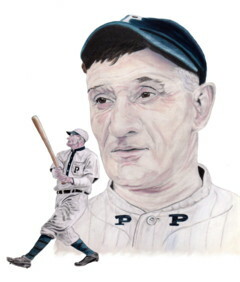 The Pittsburgh Pirates' short stop Honus Wagner was the first. Ty Cobb followed soon after. Soon, most players wanted a Louisville Slugger with their name burned on it. Bats have undergone some minor changes over the years. In 1935, the Hold Fast Grip was introduced. And in 1941 the cupped bat was invented. The excess weight was removed from the end of the barrel to more evenly distribute the weight of the bat. It used to be that most Major Leaguers favored a longer, heavier bat. The theory was to let the weight of the bat do most of the work. Today's players seem to have gone to a lighter, whip like bat to generate more bat speed. There's still nothing like the feel of a wooden baseball bat in your hands. Baseball was meant to be played with wood, not metal.